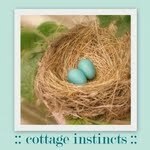 Cottage Instincts has my little old Pantry Organizing post featured in her last Make It Monday! Ack! Make my day or what?? As a side note - do you subscribe to her Cottage Crush Collection - it is DIVINE! congrats! That pantry of your's is pretty amazing!